With all the activity / fitness trackers on the market now, I wanted to try on,e but I did not find they were good value, but when DealExtreme sold Vidonn X5 fitness tracker for about $27, I decided to jump and have a try. You can synchronize data with Bluetooth 4.0 Low Energy enabled Android 4.3+ and iOS mobile device, but I don’t have any, so instead I used a netbook running Windows XP for initialization and fitness data tracking. I was quite surprised how fast I received the parcel. It was shipped by China Post, yet I received it within 9 days. Usually small items can be found without package and shipped in bubble envelopes, but this device comes in a relatively nice looking plastic box. 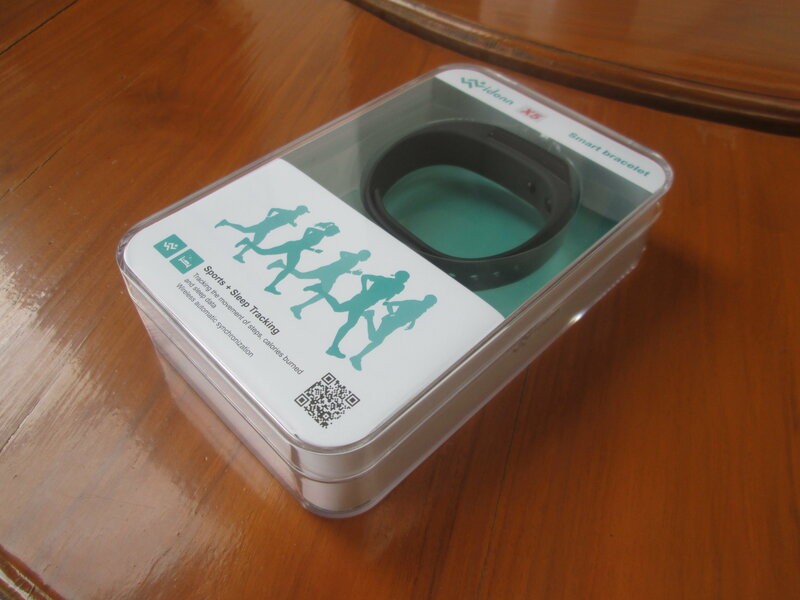 The box just contains a user’s manual in Chinglish, and the fitness band. Two clips are used to fastness the band on your wrist, and the “brain” is a USB device with an OLED display and one single button that is also attached to the band with two clips. Overall I find the device looks good, and build quality decent. The first time you’ll need to charge the device for 2 hours with a USB charger or one of USB ports of your computer or laptop. The first thing that surprised me is how small the digits are on the OLED display. It was all the more disappointing that the digits on DealExtreme were shown much larger than in reality. I had also seen other pictures with the small digit but it did not strike me at the time. I planned to use it as a watch as well, but I was quickly disappointed because you need to press on the button to display the time, and it will show for about 5 to 6 seconds, before turning off the display. Not the most convenient as a watch… Visibility is bright environment is virtually nil, so if I want to know the time, I need to press the time, and use my hand to block the sun is order to see anything. Vidonn X5 was also advertised as IP67 on Deal Extreme, albeit only IP65 on the manufacturer website, and I though I could safely shower and swim with it… However the user’s manual stipulates “Waterproof so you can wear it when washing bu without showering”, and “Please keep the bracelet in dry environment. only for water, such as the usual hand washing, rain wet”, so it’s clear its Ingress Protection rating is not IP67 (30 minutes under 1m of water), and IP65 (water proof water jets) is more like it. Having said that, I’m still showering with it, and it seems OK. Just make sure to dry the USB pins before charging as they will be wet. End result: I almost decided to return the thing, but finally I complained to DealExtreme about the tiny digits, and the incorrect IP67 rating, and it appears I’ll keep the device and get $5 store credit as compensation. A short press on the button will cycle through clock (time), steps, and calories. A long press will enter “temporary mode” start a timer, and you can cycle through the timer, steps, calories and distance as you exercise. A long press will revert to the mode where it monitors your activity continuously. The first i used it “temporary mode” worked, but the numbers of steps in the other mode was also zero, it turns out you really need to synchronize your device with a mobile phone or Windows computer by downloading the application for your OS, and running it. The online user’s manual explains how to do this in Android, iOS and Windows, but the one provided in the package skips Windows instructions. The procedure is rather simple so I won’t detail it here. 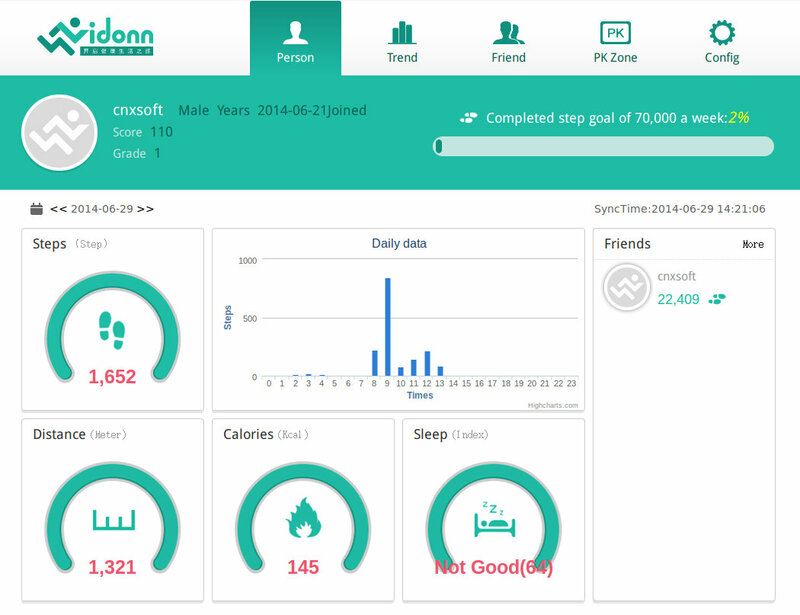 Just register an account, connect the device to your PC, click on synchronize to the the date and time on the fitness tracker, as well as optionally your personal information. The first time, you’ll also be asked to install some drivers. You can also set 8 different alarms, but I have not tried that part. I’ve now used the tracker for one week, and it seems to do a decent job at tracking activity. However, if you walk slowly it may not count steps, and it may record activities when you don’t walk, but just move your arm. I’ve right handed, and the band is on my left arm, which is probably the right thing to do, or it may over estimate your activity. I’ve just synchronized the data. Let’s see what it looks like on the web based User Center. The “Person” section will show the data for the current day in terms of steps, distance, calories, and how you slept last night (no good apparently). It also shows the details per hour. I worked in the garden at nine, and it shows a spike at that time. Clicking on trends shows the data daily for the last thirty days, weekly or monthly. The other thing I learned from this is that Vidonn X5 apparently only keeps 7 days data. Last Sunday, I went for a run and got about 9,600 “steps”, but it does not show here, so the data must be gone for good. This means you need to synchronize data more than once a week, at least every 6 days. 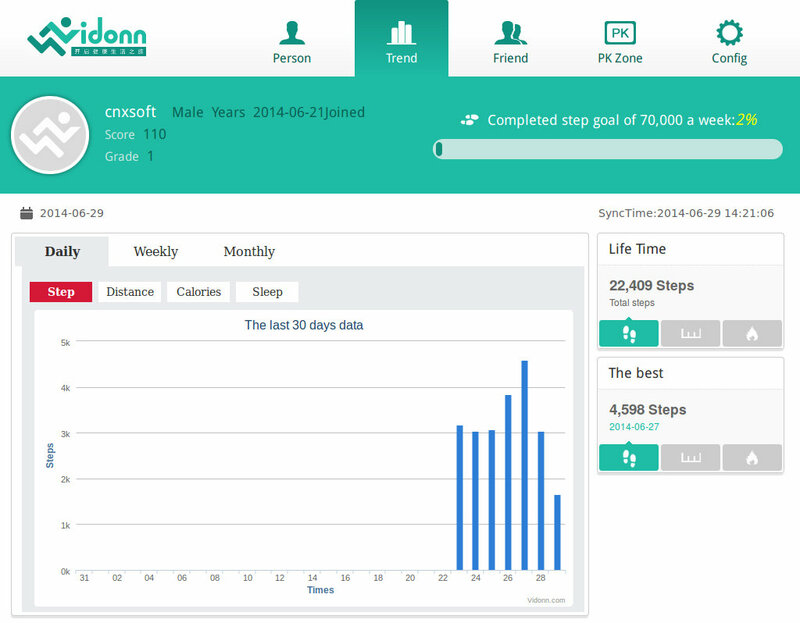 Other sections include Friends (added by phone, email, or nickname), PK Zone (Not it sure, but it may be to organize virtual events with friends), and Config to complete your profile (nickname, email, phone, height, weight, and sleep time). Sleep time is important if you want to get an analysis of your sleep. In conclusion, despite various initial disappointments, I still find Vidonn X5 is a fun device, it’s comfortable to wear, and the web interface gives a nice overview of your daily activities, and sleep patterns. Yet it’s difficult to recommend for the price it normally sells. You can’t use it as decent watch, you can’t swim with it, you are not supposed to shower with it, you can’t connect it to an heart rate monitor that would provide much more accurate estimate of calories burnt during cycling. Despite the small 40mAh battery, it takes about one hour to fully charge, which you need to do every two or three days. Using a 5V/1.5A charger, charger indicates it draws 0.03A during charging instead of about 1A for my phone, or about 33 times slower. It should be expected that it charges slower, but not that slower. 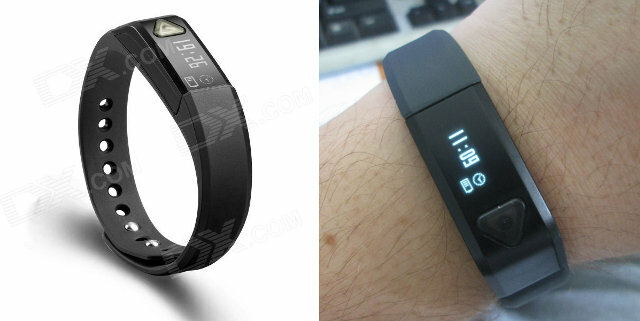 If you can live with its shortcomings and limitations, it will be much cheaper than Fitbit Flex ($100), as it sells on DealExtreme for $39.44, Geekbuying for $40.99, and you can find it on Aliexpress for $35 and up. Installing the driver on Windows is not that simple. Comes with no instructions and it does not include a Setup program. Too bad you skipped that part. Nice review otherwise, thanks. Never mind the above message, they fixed their link and now it points to the Setup program instead of driver files. The thing will still not sync neither on Vista nor Xp since the bracelet is not found. User support is also pretty bad. Help – I have just received my new fitness tracker but it is running 2 hrs ahead. How do I change the time on the vidonn x5 tracker? 2 hours might be the timezone difference between China and Australia. There must be a way to set the timezone in the app (Android, iOS or Windows). Mine seems to be calculating the distance I’ve walked wrong. I went on a 5km walk this morning and it said I’d only gone 3.2 Kms. Have you heard of this happening and if there might be a fix to it? If you’ve already inputted your correct weight, height, and gender, there’s not much you can do. I’ve also noticed it underreports the number of steps.